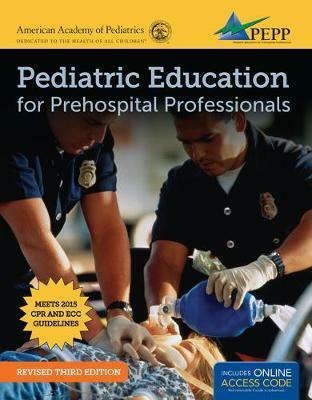 * The textbook content addresses every pediatric-specific competency statement in the National EMS Education Standards. * Shock and resuscitation content is covered in two separate chapters, placing more emphasis on these critical topics. * A top-flight EMS author team working in conjunction with AAP physician reviewers ensures exceptional medical content with a "street" focus. * The Pediatric Assessment Triangle (PAT) represents the essence of the PEPP patient assessment method, which includes assessing appearance, work of breathing, and circulation to the skin. * The Patient Assessment Flowchart provides students with an easy-to-understand reference of the pediatric patient assessment process. * Case Studies provide an opportunity for critical thinking and encourage students to consider how they would treat a similar case in the field. * Procedures provide written step-by-step explanations and visual summaries of important BLS and ALS pediatric skills. * PEPP Course Coordinators now have the option of offering onsite or hybrid courses. * The hybrid course includes engaging, interactive online modules that students complete before attending the onsite portion of the course for scenarios and hands-on skill stations. * The onsite course includes case-based lectures, live-action video, small group scenarios, and hands-on skill stations.